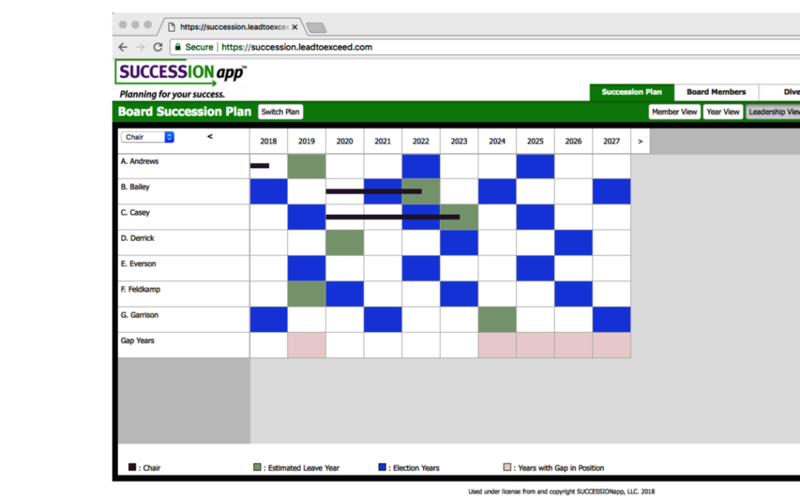 Madison, WI – October 26, 2018 – SUCCESSIONapp, LLC announces an enhancement to its succession planning software platform, SUCCESSIONapp® that ensures smooth transitions in board leadership. “There is a lot of turnover taking place in credit unions right now, not only at the executive level, but on boards as well. We have a proven solution that simplifies director succession planning and has helped many credit unions over the last several years anticipate when director openings will occur, and what expertise to look for in future board members. Now, we are rolling out an enhancement to the online software that will help credit unions answer the question, “Who will lead the board in the future?” said Evers. To learn more about SUCCESSIONapp® and our new Board Leadership Module, visit www.successionapp.com or contact us for a free demo at support@successionapp.com. SUCCESSIONapp, LLC is the leading provider of online CEO and board succession planning solutions in the credit union industry. The mission of the company is to help executives and board members create succession plans to ensure smooth and successful transitions. Yvonne Evers, the CEO and owner of the firm has successfully worked with hundreds of credit unions over the past 25 years. Visit successionapp.com to learn more.